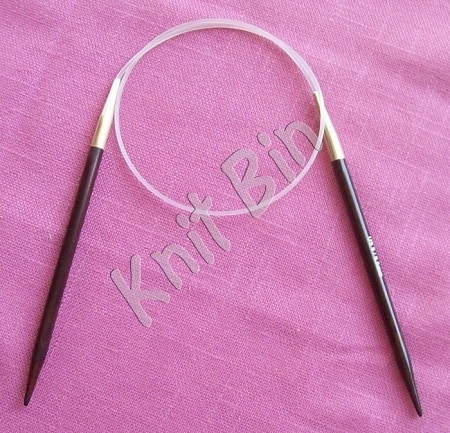 Produced by expert artisans in Nagina, India, these beautifully crafted circular needles are a privilege to own. The color is rich, and the finish is exceptionally smooth and durable. In my tests, they've been the best needles I've ever worked with! Much lower in price than big-name competitors, so you can't go wrong with these wonderful needles. With these fine needles, you'll know that you are working with the best! And they're available up to size 19! Fabulous knitting. Lovely smooth needles with sharp points. Plan to add more of them as budget allows. I was MOST pleased with the order I placed. It was so satisfying to deal with a merchant who was more than accommodating, prompt and pleasant in my dealings with her. I LOVED the rosewood needles...had heard about them but never used them. Wonderful! The yarn I purchased was perfect, too. I could not recommend anyone more highly than Deb when you need yarn and anything that is included in your project. This review covers all I bought. The experience was fun, rewarding, and very satisfying. Thank you! These needles are absolutely beautiful. The join seems perfect, and the finish is like nothing I've ever seen. I'm rating these a four, because the points were actually sharp. I blunted the tips a little bit with an acrylic nail file and nail buffer. Surprisingly, the finish was unaffected and the tips are still pointed enough for lace. I will definitely buy more from this brand.